With the start of 2015 we are pleased to introduce the first new product from our suppliers. 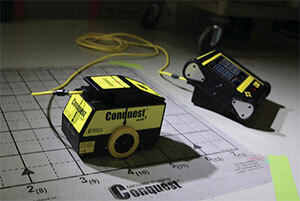 The Conquest 100 is the latest iteration of the popular Conquest GPR range, offering quick scanning for rebar, post tensioning and other embedments in concrete. Our articles this month are a technical overview of compression machines and force measurement and a case study on locating post tensioning with GPR systems. Sensors and Software have released the new Conquest 100, the successor system for the Conquest SL. Compression Machines are used to determine compressive, splitting and flexural strengths. Most commonly applied to materials of high compression but low tensile strength, in which the specimen is subjected to increasing compressive forces until failure occurs. The compressive strength of the specimen is calculated by dividing the maximum load attained during the test by the cross-sectional area of the specimen. This article will discuss the compression testing and the compression machine. Compression machines have to be selected depending on the maximum expected specimen strength, shape and dimensions. Those requirements determine the capacity of the frame, the type of spherical seat and the platen dimension. In Australia, cylinder specimens shall be accepted for testing if they are moulded in accordance with AS 1012.8.1 and are free from defects likely to affect their strength. PCTE offers various models of concrete compression machine at different level to suit market needs: Manual, Semi-Automatic and Fully-Automatic Compression Testing Machine with different capacities. The main parts of compression machine are the Frame, Hydraulic Power Pack and Data acquisition and control unit. Load frame, Compression platens, Upper platen with ball seating, lower platen, Loading Cylinder Assembly, Distance pieces, Limit Switch and Front and rear protective doors. Hydraulic power pack supplies required oil to the load frames for loading. Data Acquisition and Controls Systems are to operate the machines mechanical systems and process data from load cells or pressure transducers (installed on the compression machine frame and additional frames). Data is able to be collected from the data acquisition system and transferred to data management software via serial port or network cable. Data such as peak load, load rating, etc. can be recorded and transferred. Correct operation of a compression machine leads to reliable data. It is important to perform the testing as promptly as possible after removal of the test specimen from the curing environment. Specimen should be tested in a wet condition unless otherwise specified. Dimensions should be determined in accordance with AS 1012.9 with surplus water wiped off specimens. The platens of the testing machine and the bearing surfaces of specimens should be cleaned which include films of oil, free loose particles or all traces of lubricant. Placing the specimen on the bearing block with top and button surface and in horizontal position. Carefully align the axis of the specimen with the centre of thrust of the spherically seated platen. The hydraulically activated platen needs to be floating before bringing the upper platen and the capped specimen together (when the uniform bearing is obtained). Apply the force without shock and increase continuously at a rate equivalent to 20±2 MPa compressive stress per minute until no increase in force can be sustained. Stop once the specimen fails (often observed as crack and splintering and record the maximum force applied to the specimen as indicated by the testing machine. If an abnormal test result is obtained, fully break the specimen to facilitate further examination. The compressive strength of the specimen can be worked out by dividing the maximum load applied to the specimen during the test by the average cross-sectional area and express the result to the nearest 0.1 MPa. The cross-sectional area should be calculated from the average of the two measured diameters of a cylinder samples or side dimensions of cube samples. Data recording and reporting procedure need to be in accordance with AS 1012.9. Post-Tensioning (PT) is a method of reinforcing (strengthening) concrete or other materials with high-strength steel strands. The benefits post-tensioning brings to a structure include large open plan, column free floor spaces. One of the main applications of the Conquest is to locate PT. Its antenna has the right frequency to develop a crisp image and at the same time get the necessary depth, this combination is a critical factor when locating PT.